We are Deb and Scott Tucker. After decades in corporate America we agreed it was time to start living our dreams. 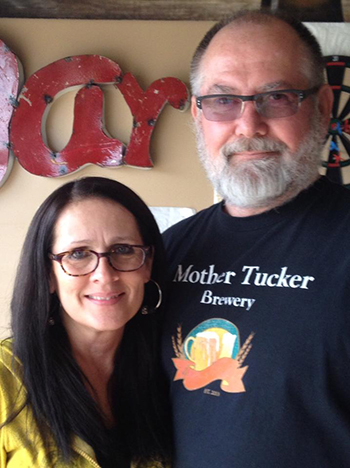 So after 30 years, with one of us in risk management, we decided to take a calculated risk of our own and start Mother Tucker Brewery. The premise was simply to create an environment that incorporates all the things we love: time with family, great music, chillaxin’ with friends and of course, brewing delicious beer. From there, it became clear that we needed to open a brewery and tasting room. We were, after all, already home brewers, making beer that our friends, family, and neighbors just couldn’t get enough of. Our “family-centric” concept lead us naturally to the name; the Tucker Family mothers have lovingly been called “Mother Tuckers” for 3 generations. Add to this the overwhelming support of the Thornton community and Mother Tucker Brewery practically jumped into fruition. Not to say there wasn’t plenty of hard work that went into creating each of our distinctive beers and designing a tasting room that truly feels like home. But, it has all come together as if it were meant to be. We are so happy we get to spend our happily ever after doing what we love with the ones we love and making new friends along the way. If you haven’t ventured into our cozy little corner of the world yet, please do! It won’t be long before you become part of our family of patrons! Until then….peace, love, harmony, and CHEERS!